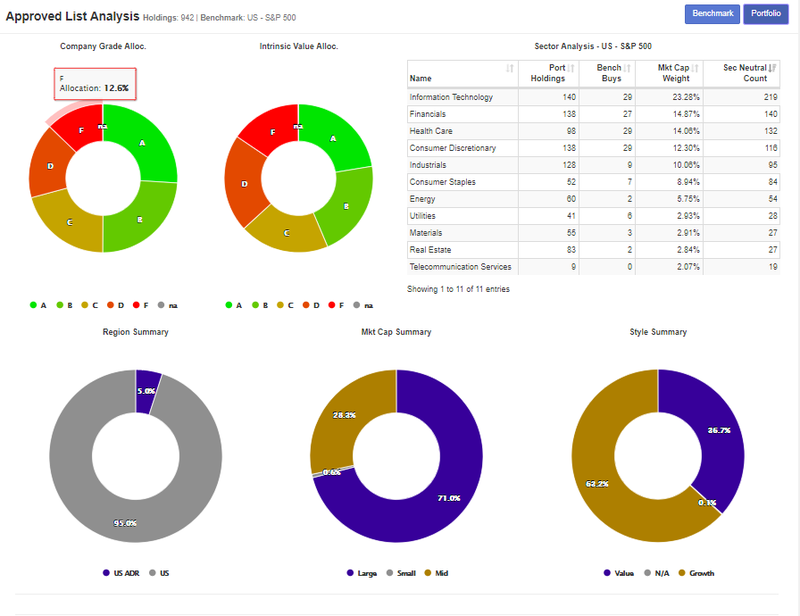 Quickly analyze a prospective client’s portfolio and diagnose potential problematic areas with AFG’s portfolio expectations interface. Portfolio managers can leverage the models built by their analyst or rely on AFG’s default models to identify attractive investment opportunities based on Valuation, Management Quality, Earnings Quality, Economic Margin Momentum, and Price Momentum variables. Screen on over 1,000 variables and leverage AFG’s multi-factor model to develop focus lists for any country, sector, industry, or style of investing. The AFG Company Storyboard is a set of three reports that allows investors to get a helicopter view of any company in our database to quickly understand the firm’s valuation story, profitability levels, ability to create wealth for shareholders, how well our model has tracked the firm and in turn efficiently communicate that information with clients. 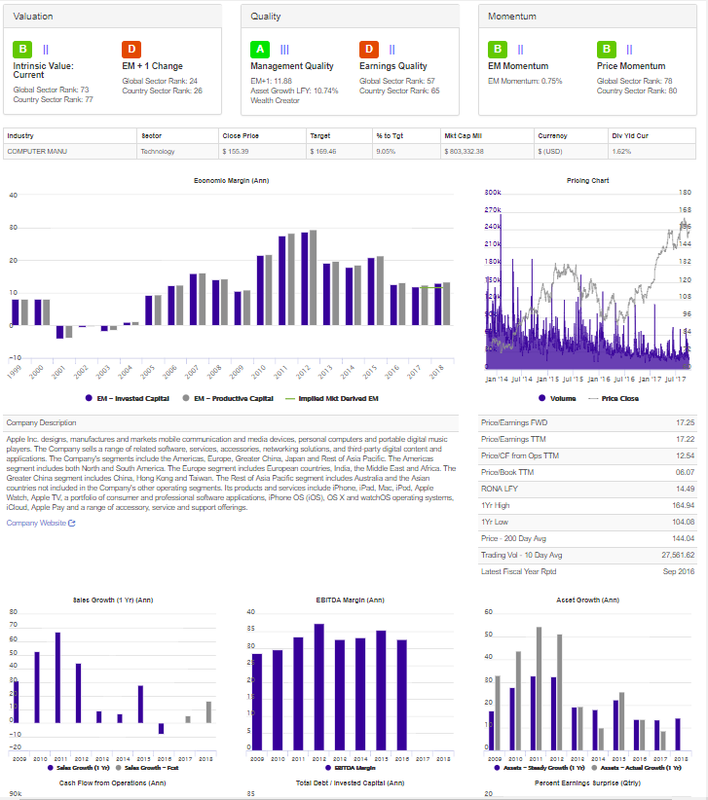 AFG’s Company Snapshot provides an efficient overview of a company’s characteristics, quantitative grades, fundamental data, historical performance and pricing history. This resource serves as a tearsheet to introduce a potential investment idea or review and monitor an existing holding as the first step towards finalizing an investment thesis through additional due diligence. AFG’s Wealth Creation Report is a 3-part report that helps investors quickly understand how profitable a firm is from an economic standpoint as well as how much the firm has been able to grow its asset base. Ideally, we would like to focus on profitable firms that are growing their business in order to maximize profits. The first chart in AFG’s Wealth Creation Report displays a company’s Economic Margins (EMs) through time, which is AFG’s proprietary measure of corporate performance. This metric tells us how profitable the company is by measuring how much the company earns above or below its cost of capital. Once you can see whether the company is profitable or not, you want to see what management is doing to take advantage of that profitability or make adjustments for the lack thereof. If a company is profitable you want to see them growing their asset base to maximize their profitability. Conversely, if the company is not profitable you would like to see management divest losers and focus on its core-competencies to get profitability back on track before growing out its asset base. 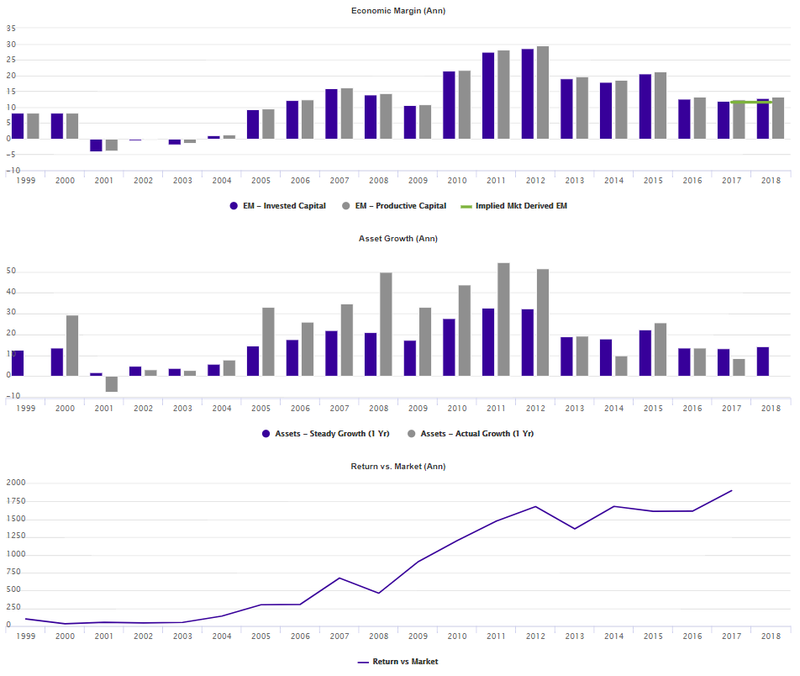 These two charts used in combination will tell you whether the company is following a wealth-creating strategy or not and the bottom chart shows the company’s cumulative total return relative to the largest 2,000 companies in the AFG universe.